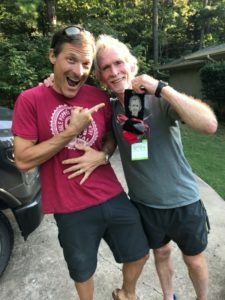 One day in 1988, Joe Fennel, Randy Rhine and Kelly O’Meara, the Fayetteville High School cross-country coach, were out running. Kelly mentioned that his cross- country budget was $100.00. In the days before development programs, there wasn’t money for sports other than football and basketball. Joe and Randy were shocked and decided to do something about it. They created the Chile Pepper Running Club and from there, the Chile Pepper Run. It was originally held in May and consisted of the 10K open run only. The Chile Pepper Cross Country Festival was created in 1992 to bring together three northwest Arkansas cross-country races under a single event – the Chile Pepper Cross Country Festival, which is now one of the premier running events in America. The Festival united the Chile Pepper Run; the Arkansas Invitational, the annual Lady’Back and Razorback home meet; and the Fayetteville High School’s Purple Dog Invitational. Now the Chile Pepper hosts approximately 6,500 runners and over 6,000 spectators each year and is one of the largest cross country festivals in the nation. More than $650,000 has been given to northwest Arkansas cross-country programs. $77,000 was donated in 2017.